I found this recipe over at SkinnyTaste.com. This is the perfect dessert to take to a 4th of July Picnic. It's quick and easy to make! Do you have a go to dessert you like to make for the 4th? 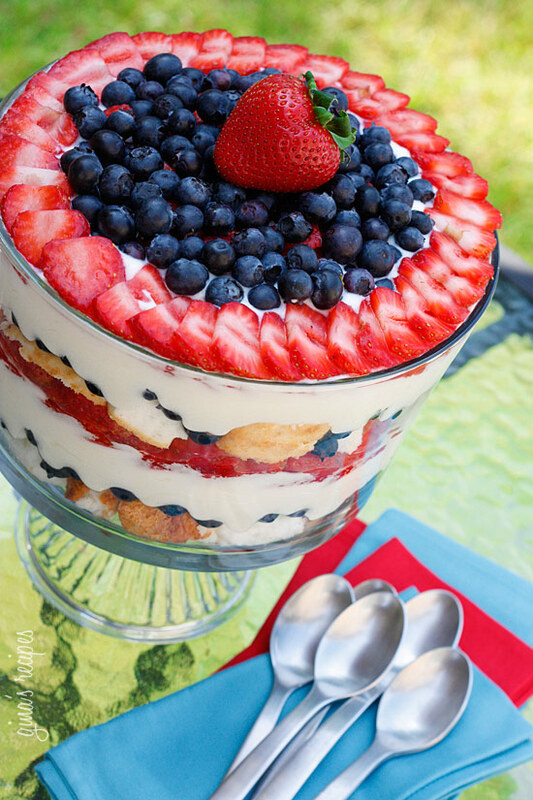 A heavenly mixed berry trifle made with summer fresh blueberries, strawberries, white chocolate pudding, angle foods cake and cream. 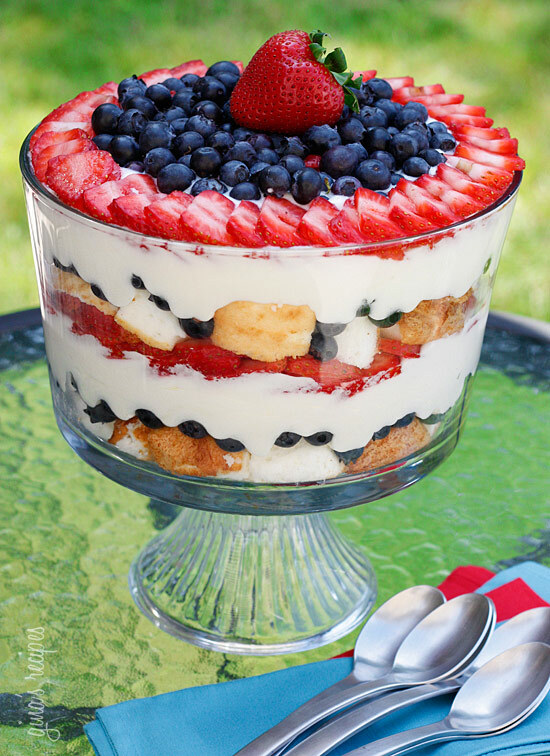 A beautiful guiltless dessert that would make your July 4th table proud. I gave some of this to my dessert-loving brother and he raved about it and told me to make sure I let you all know how fabulous this is. He's right, this exceeded my expectations and I probably ate more than I should have, oops! Using store bought angel foods cake makes this quick and easy to prepare and no need to heat up the kitchen, but you can use a box mix or make it from scratch if you prefer, whatever you decide this will still be fabulous! Arrange half of the cake in the bottom of a 14-cup trifle dish. Sprinkle evenly with a layer of blueberries. Spread half of the cream mixture over the blueberries and gently spread (I piped it using a plastic bag and cut the corner off). Top with a layer of strawberries. Layer the remaining cake cubes on top of the strawberries, then addmore blueberries and top with the remaining cream mixture. Finish with the remaining strawberries and blueberries, arranging them in a pretty pattern. Cover and refrigerate at least one 1 hour. P.S. Today is the last day for Google reader. I hope you will to continue to read my blog by signing up for Bloglovin (icon located on the right side of the blog) or sign up for emails also located on the right side of the blog. Don't Take Anything Personally: Nothing others do is because of you. What others say and do is a projection of their own reality, their own dream. When you are immune to the opinions and actions of others, you won't be the victim of needless suffering. Don't Make Assumptions: Find the courage to ask questions and to express what you really want. 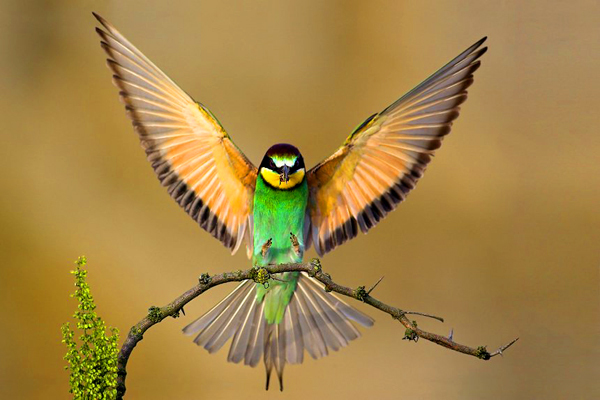 Communicate with others as clearly as you can to avoid misunderstandings, sadness, and drama. With just this one agreement, you can completely transform your life. ~ Don Miguel Ruiz from The Four Agreements. Design Confidential With Rachel Cannon Lewis! Typically on Fridays, I have been posting a "Fabulous Friend", but lately many blogs have adopted the interview type post that I was doing, and I've gotten a little bored reading them so figured if I was bored with them, you probably were too. It's time to shake it up a bit folks! Today I'm sharing someone who is a fab friend, but instead of interviewing her I decided I would share some of her work and a new workshop she had designed. Rachel Cannon Lewis is a very talented designer. 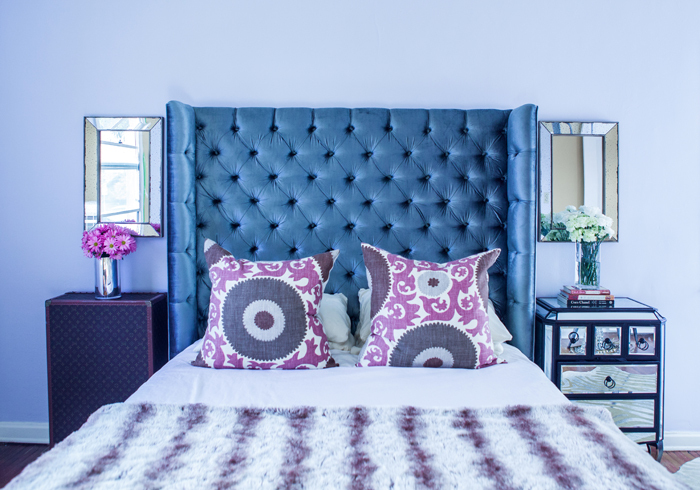 She launched SoHaus Interior Design in 2009 and since that time has gained local and national notoriety. 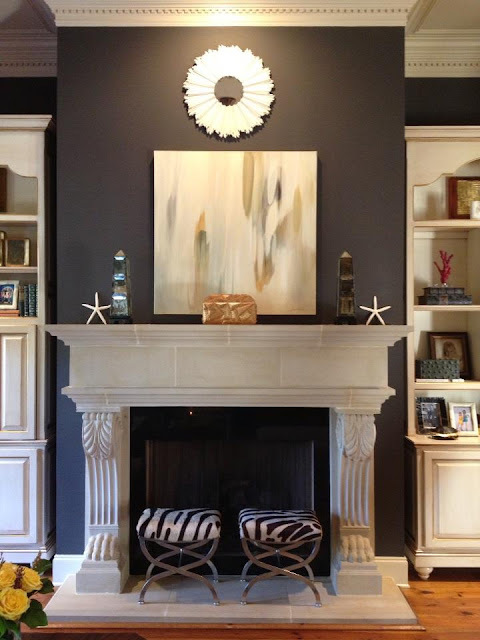 Rachel offers her clients both concierge and premier interior design services. 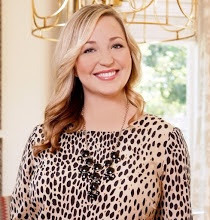 Her high standards for her firm and her clients is what sets her apart from the pack and has made her firm one of the leading interior design resources in the high end marketplace. Rachel knows it take not only talent, but hard work, experience and often some visits to the school of hard knocks, to become a successful designer. Now she is willing to share her secrets with you! How would you like to obtain secrets from top designers? 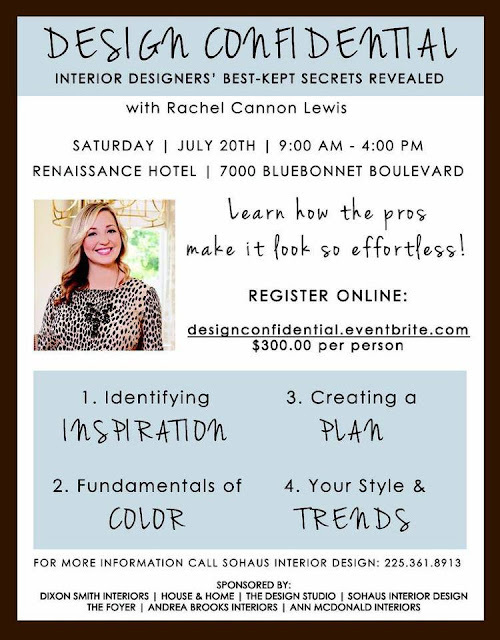 Rachel has developed a "must attend" one day seminar called "Design Confidential" where she will share her "best kept secrets of interior design". Rachel isn't the only one sharing her secrets, she has also lined up a star studded slate of fabulous designers who will be sharing their secrets as well. It's not necessary to be in the Baton Rouge area to attend. Hop on a plane or in your car and come on! It will be worth the trip! You will meet designers from all over the country, network and have fun, all while learning tons of insider info! My friends, Ann Mcdonald, Andrea Brooks and Traci Zeller are all participating. (Wanna get a first hand meeting with Traci Zeller's new textiles?) Let me tell you, if you just heard Rachel and those three you would walk away amazed, but there are two other design authorities speaking as well. Whether you are new in your business or a seasoned designer, this workshop will deliver content you can utilize. To learn more about the event visit eventbrite here! The Renaissance Hotel in Baton Rouge, Louisiana. it sells out!! Only a few more spots available! Swag bags provided to all attendees! about SoHaus Interior Design please visit her website here! 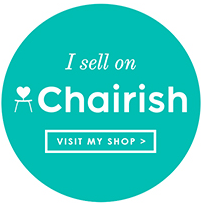 Want to learn more about Rachel, SoHaus or the workshop? if you want to see an example of one of my design boards, make sure to pop over and visit Fieldstone Hill here! While there get to know Darlene, you will love her and her work! 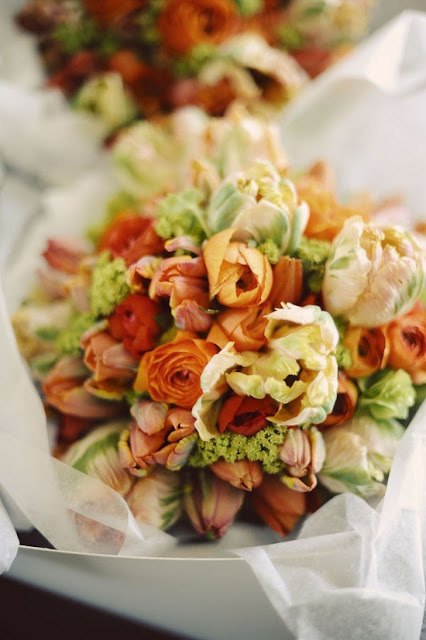 Here's wishing you a fabulous weekend! Labels: Andrea Brooks, Ann McDonald, Design Confidential, Rachel Cannon Lewis, Traci Zeller. I decided to share a few pictures of my beach house this morning. 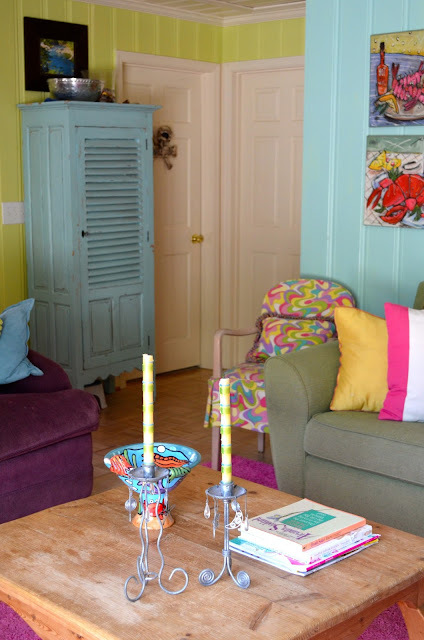 Our house is a quaint little place located at Topsail Beach, NC. Topsail is located between Jacksonville, NC and Wilmington, NC. It's a very "old school" kinda beach. Not much commercialization. We love that about it and hope it stays that way! Our house is located on the south end of the island in a close knit little community. We have a corner store, where I bought candy as a child. We also have three restaurants, the Beach Shop Grille, Homeport and The Breezeway, other than that not much here other than The Gift Basket, Putt Putt Golf, and the Fishing Pier. We did get a new shop this year called South End Outfitters. Everyone was so excited!!! Oh, I almost forgot our cool local bookstore, called "The QuarterMoon", where you can buy books, smoothies, coffee and most recently wine and beer. They have sunset music and drinks on the lawn which the locals are enjoying. Welcome to my summer office!!!! for her trip to Disney one year. I was happy to oblige! my niche for my interior design business is "intentional design"
Everything I design has a reason or intention for myself and for my clients. two different colors! 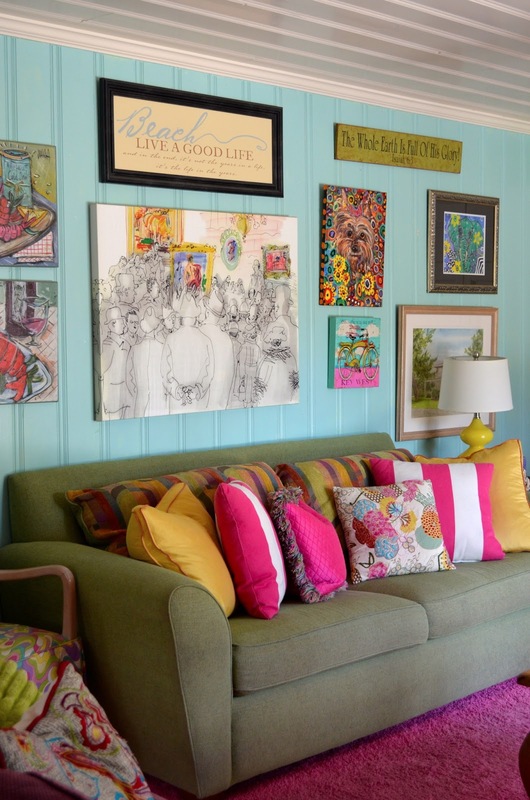 To say this house is colorful is an understatement! Every Spring I make a commitment to finish up projects by June 1st, so that I can transition to my beach house for the summer months. My sweet husband stays behind to work during the week and take care of the home front. He does visit us on weekends though, which is nice. My parents and my siblings all have houses here as well. It is the only time of the year,my children get to spend time with my family, other than holidays. My sister and her family share a house with us. We love it when they are here. Her boys and my boys are about the same age and love spending time together. They ride bikes,play baseball and go to the beach together. I love it when my niece Lily comes up for craft projects. I have featured her here on the blog as my "design assistant" several times. I love to watch my niece McKinley on her daily runs around our house! She is an inspiration! It's not always beach days and blue skies here, but it is a calmer, simpler life for me with the kids. I do continue to do e-design while here and often commit to local projects, but this summer, I have decided not to work very much, so I'm taking limited projects. It seems nice to slow down a bit. My schedule over the past year has been crazy, so I welcome the break from work and travel. I don't keep a schedule when at the beach. I tend to go to bed earlier and get up earlier. I love the early morning quiet, before everyone rises. Our house is small so once everyone is up, the house is full of activity and it's hard to think. I am enjoying my daily walks on the beach and visits with neighbors. We have an "open door" policy here, so lots of visits from neighbors. Our door is like a revolving door at times! Our house sits on a lot that is surround by a street on three sides and has a big glass door, so at times it kinda feels like living in a "fish bowl" because people drive by and look. I often wonder what they are looking at, but then it could be they are wondering who would live in a house with hot pink doors and adirondack chairs painted turquoise with pink, white and yellow polka dots. Those two elements gives clues to the interior design as well. As you can see from the pictures our house doesn't lack color. I called it "caribbean crazy". It's much like our attitude when at the beach which is "life is short, enjoy to the fullest" and that's exactly what we plan to do....all summer long! I have had readers email and asked to see pictures of the beach house, so I decided I would post a couple this morning. If you would like to see the rest of the house, just post a comment below. I don't want to assume my readers really want to see the house so I won't post unless you seem interested. 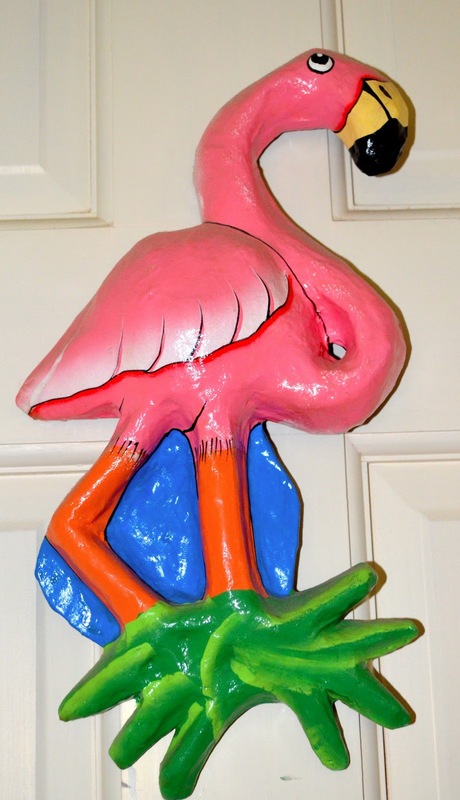 Fanny the Flamingo says "Island Living is the best"
Speaking of island living, one of my style icons is India Hicks, daughter of the legendary David Hicks, she also lives on an island but does so year around. I love to see pictures of her playing on the beach with her children. Her life looks so idyllic. I just received an email about her private sale....Did you get the email? If not, pop over and check it out. Hurry, it's only this week! I have already loaded my cart! 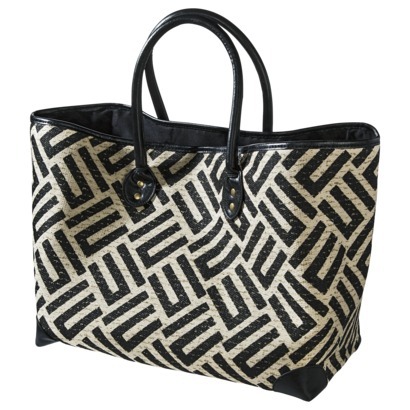 I love everything India Hicks. more I will only share if I get enough readers who are interested, so if interested please comment. I don't want to bore you guys! Hopefully, I will be able to talk a few of my friends down here into letting me share their homes on the blog. There are some really beautiful homes here! My 7 Favorite White Paint Colors! White is hot! Are you following the trend and using white to brighten up your home? If so, what are your favorite white paint colors? I find white so calming when used alone, yet becomes so vibrate and crisp when paired with colors. Are there secrets to making white work in a room? Is it interesting architectural details? Texture? Addition of color? Is it a restrained palette? Or all of the above? 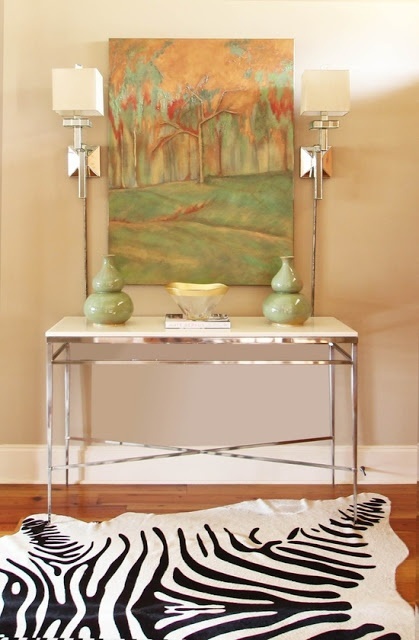 If you don't have interesting architectural details you may, still create a beautiful room with a few well placed unique pieces of furniture or art. Texture becomes really important to the success of an all white palette. Choosing the right white is also paramount. Just like all colors, white can have warm and cool undertones. 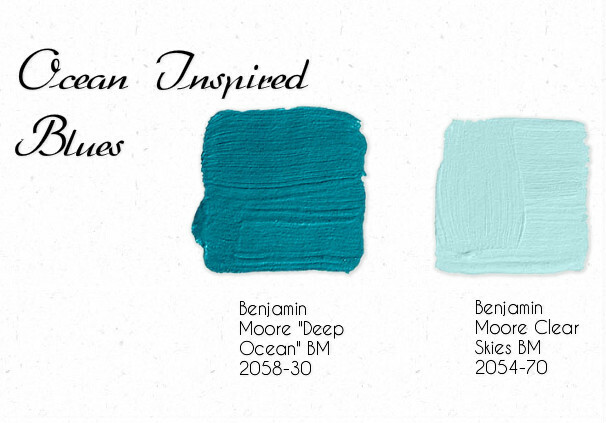 Choosing the right undertone to work in your house and with your color palette is a must. There are several things that can determine what undertone your white should be. If you are starting with an empty room, things like the natural light, hard furnishings like wood floors, tile and fabrics can dictate which white is best. 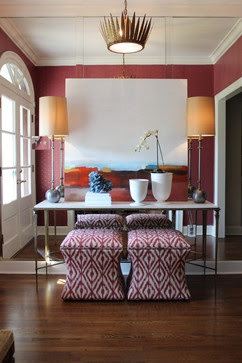 If you already have furniture and will be painting your walls, furniture will be important to consider. White is versatile. If you get tired of an all white room, you can easily add accessories or art and instantly gain a fresh look with color. 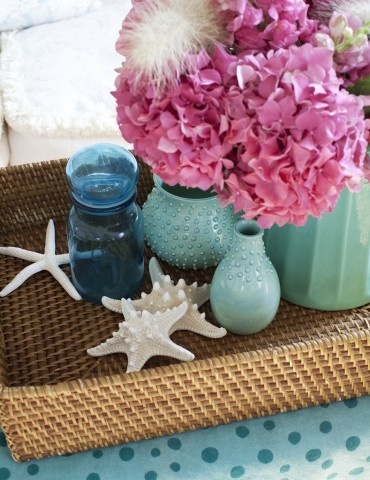 Changing out accessories is the least expensive way to give decor a different look, so this is something to consider. 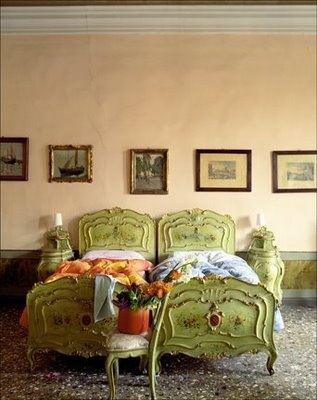 In the first photograph above, color comes from the flowers which can change every season giving the room versatility. 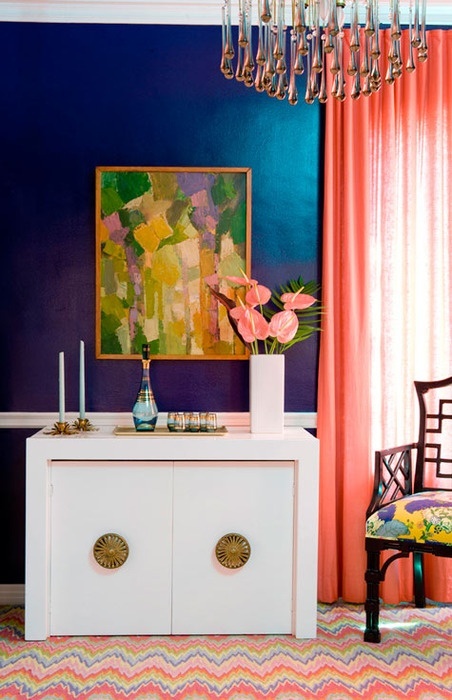 In the second photograph, Myra Hoefer keeps the palette very neutral with only a pillow and flower arrangement adding color both of which could easily be changed to vary the palette. 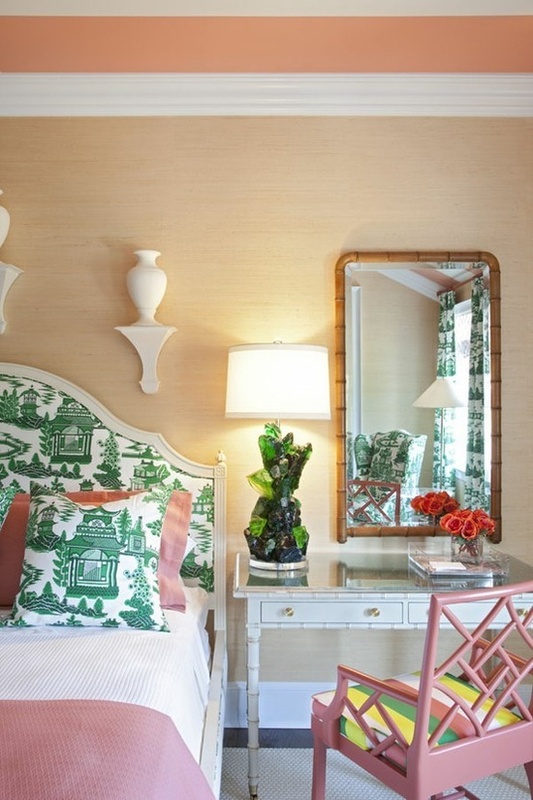 In the third photograph, Tobi Fairley designed a white room with pops of color for The Holiday House in New York City. 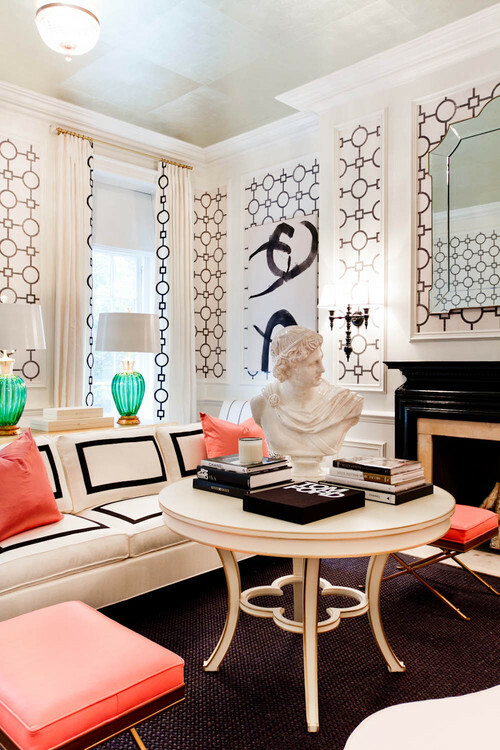 The room has black and white wallpaper within white trimmed walls, along with white sofa, white draperies and other white furnishings, but this room is definitely not void of color. In this room white lays the foundation for the other colors to shine. This room has interesting architectural details, but if yours doesn't you may have to work a little harder to make your room interesting, but it can be done by just as Tobi has done with the addition of wallpaper, interesting furniture, art and accessories. Below are some of my favorite white paint colors. What are your "go to" whites? Today I'm over at Fieldstone Hill Design with several other designers sharing our favorite whites. If you would like to know our our top white paint choices, pop over and check them out here. 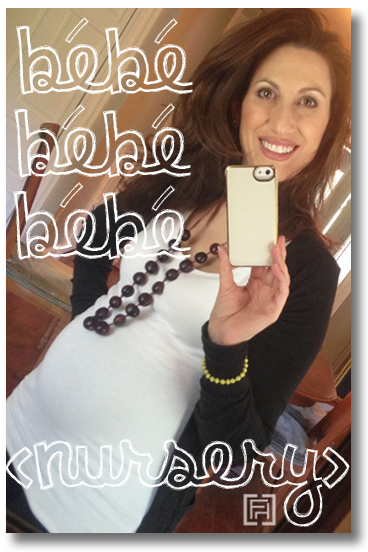 Darlene, the editor & designer at Fieldstone Hill Design is getting ready to have a baby and is decorating her nursery. Darlene thought it would be fun to ask a group of her designer friends for recommendations of favorite white paint for the walls. "If you don't currently follow Fieldstone Hill Design you are missing out", Darlene is a doll and a fabulous designer! She is always offering great tips on design and sharing her own projects as well as those for clients. It's fun to see what we all chose. Some only chose one and others (I won't mention who, looked piggy and chose 7!) Oh well, you got a list of the ones I do love! This group has a board on Pinterest called "Must Follow Interior Designers" where many of the groups projects are pinned. I invite you to follow, if you want to see more of this groups work! Also, take a sec and check out my PInterest board dedicated to "White Rooms" if you want to see more white room goodness! Enjoy! On another note, I would like to thank House Beautiful for naming me one of their Top 5 Blog Post of the Week this week!!! What an honor to be among such awesome company! I love to visit their site. It has so many interesting articles. What's In My Beach Bag & Things I Can't Live Without At The Beach! I like to have several beach totes to match my various beach ensembles so it helps when you can find something this cute at Target! It's roomy and holds all my beach/pool essentials. Best Navy Blue Paint Colors - 8 of my Favs! "Americans have a love affair with blue and white" reported Krissa Rossbund, Senior Style Editor of Traditional Homes Magazine. in her talk at Tobi Fairley's "Get Published" Camp in April. 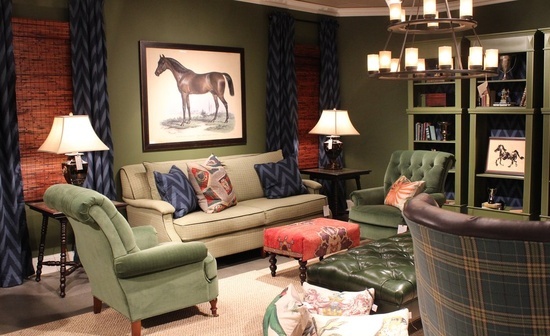 Whether dark and dramatic or bright and preppy, blues are versatile. 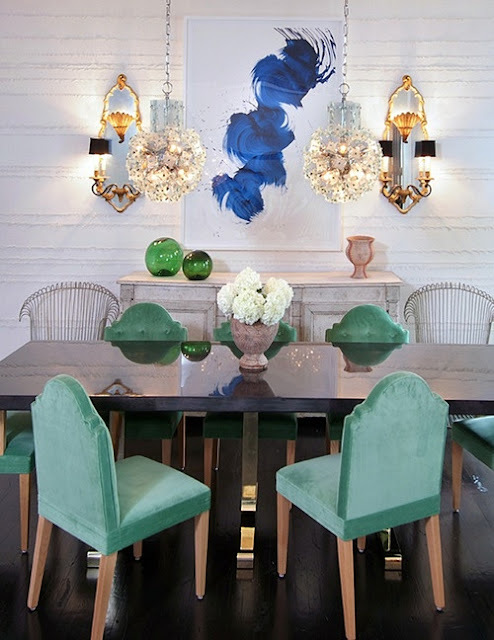 Blue is equally at home in a dining room or a child's room. I am currently working on a project where I am incorporating blue in the color scheme and thought I would share some of my favorite navy blue paint colors with you in case you are looking for one yourself. 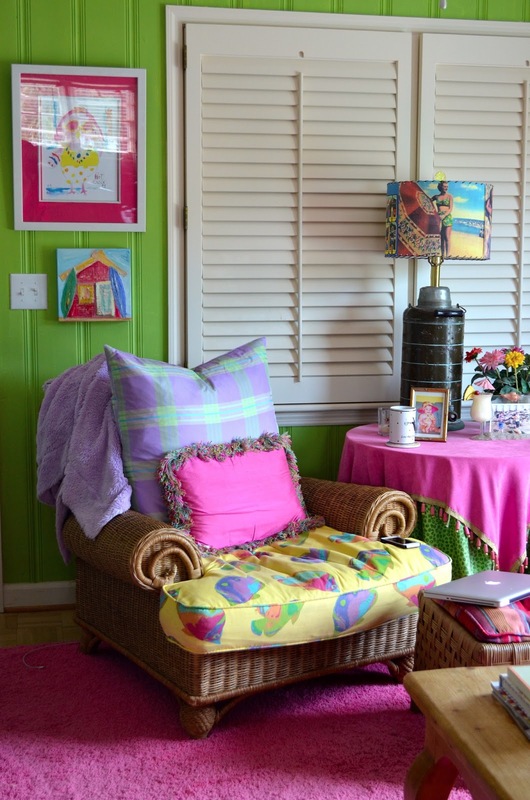 Of course, it is best to always start with fabrics, rug and art when choosing paint colors. 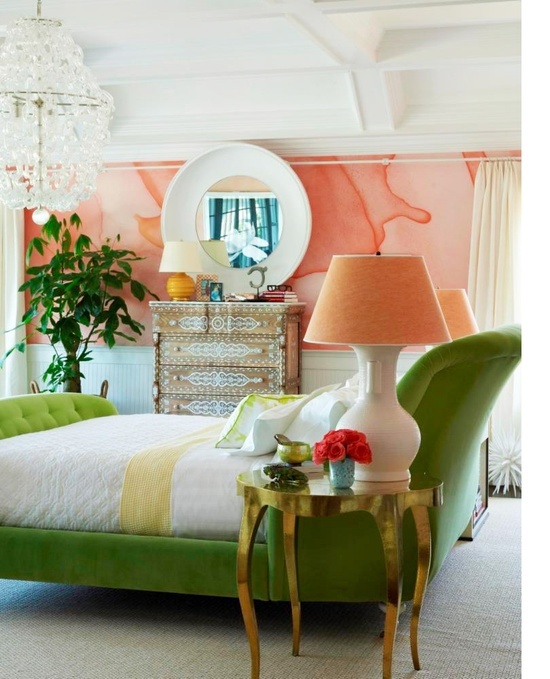 Let paint be your last selection unless you are in love with a certain paint color and want it to be the star of the room! 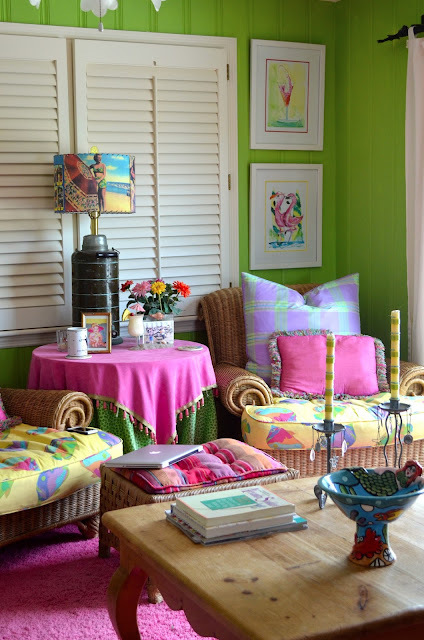 It is much easier to match paint to fabrics, or art than it is to do vice versa. I have been trying to write a post the past two days and I am beyond frustrated! 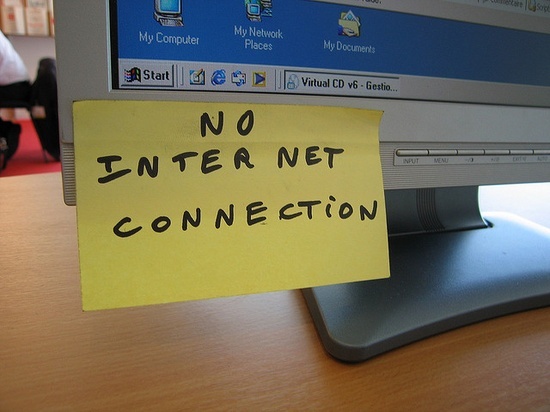 It is taking forever to pound out one sentence, because my internet connection keeps disconnecting. It goes and comes like the wind. I have a tech guy coming out tomorrow to see what the issue is until then, I am going to play on the beach with the kids! Please check back soon! 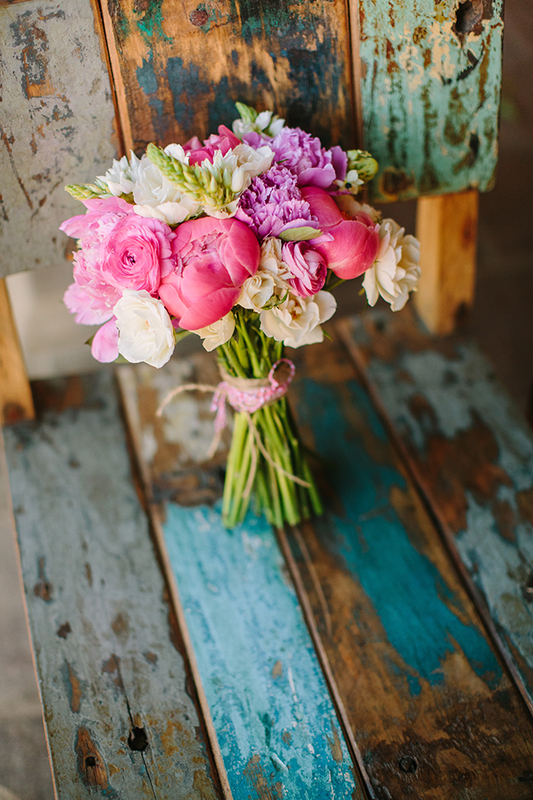 How do you pull together color palettes for your projects? 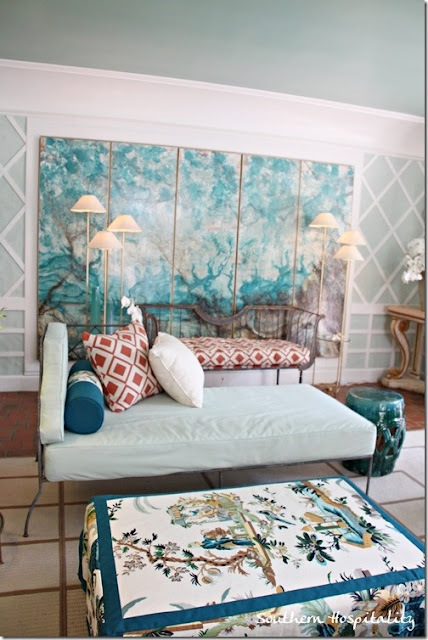 Some people start with fabrics other designers start with a rug or a painting. 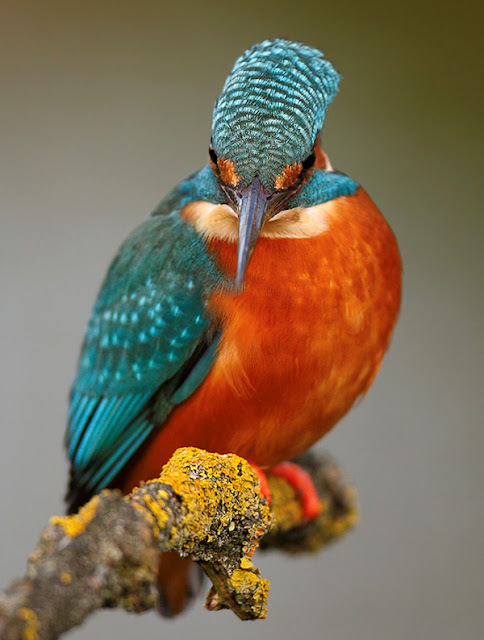 There are many ways you can create color palettes but one guarantee path of success in creating color palettes is to take cues from nature. Have you ever really looked at the colors of a forest? The trees aren't just green. Have you ever really looked at a seashell? It isn't just white is it? out the answer to that question is to answer is to ask yourself, "Where you find comfort". 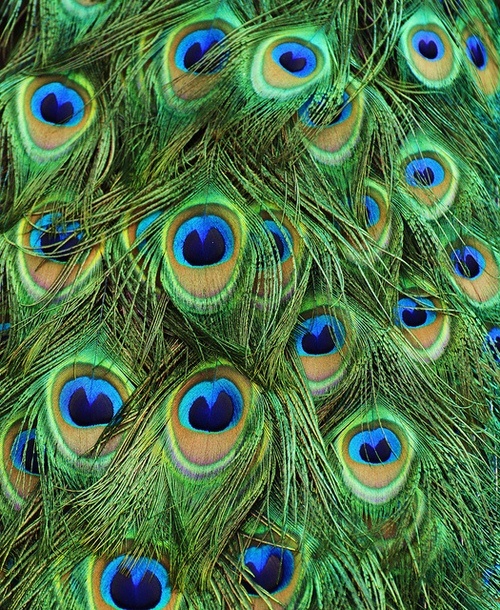 basically anything in nature can serve as a springboard to create a perfect color palette. 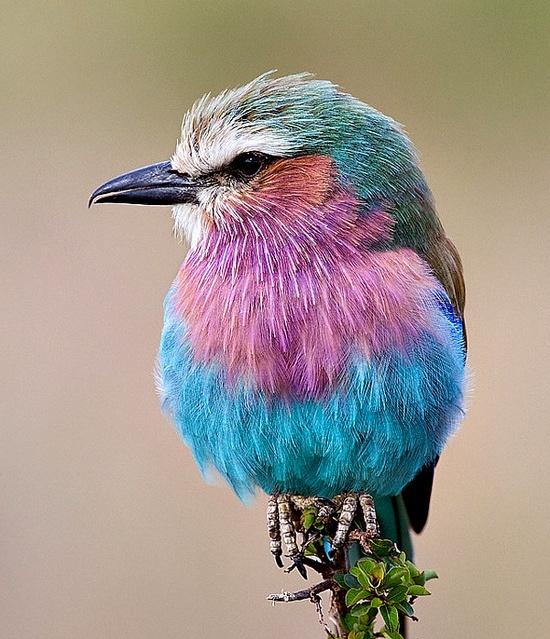 of colors present, because these secondary colors are what bind the dominate colors together. 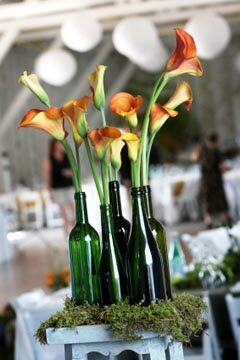 You may also find you need to add an accent to make the palette pop. 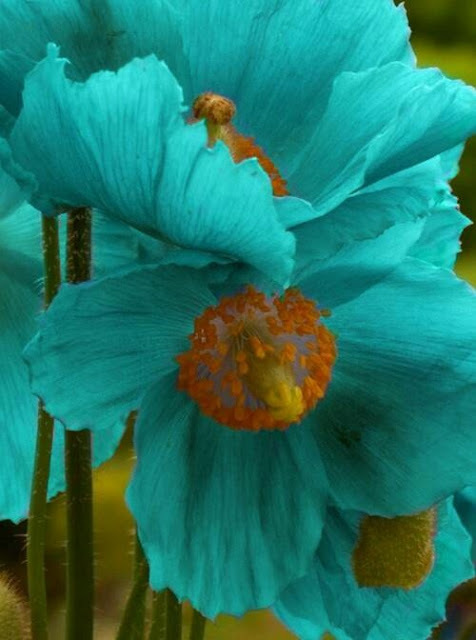 For example, I am naturally drawn to blues of any shade. 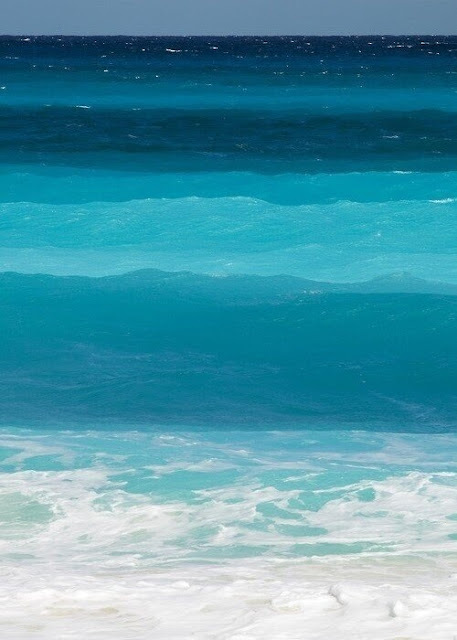 I love the look of blue with almost any color depending on the shade and most especially with white, it's so crisp and clear. 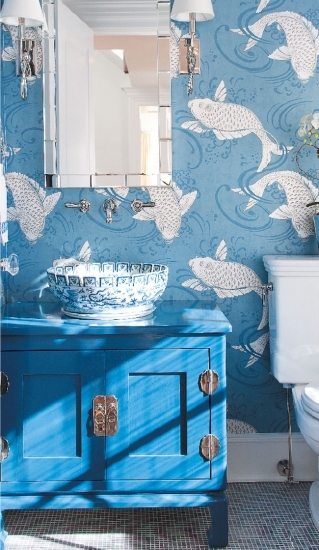 The powder room featured below has always been a favorite of mine and I have to think it is because it reminds me of water. When I look at this photograph, I never tire of seeing it, even though I have seen it now hundreds of times. 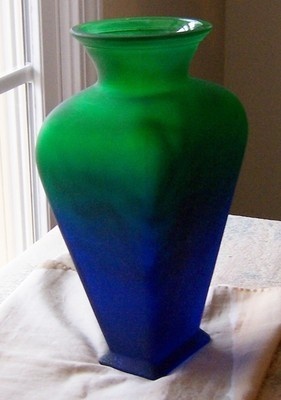 When you find your authentic color palette that's what happens, you never tire of it, it's timeless. 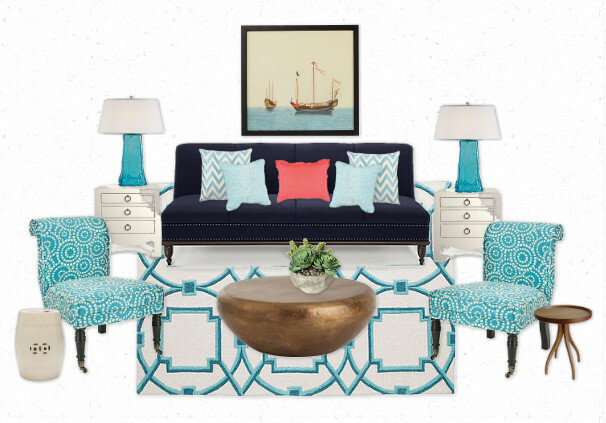 add the deep navy sofa to represent the deep blues found deep at the ocean floor as well as a coral pillow, but I'm pretending it's like the coral found in the ocean as well. 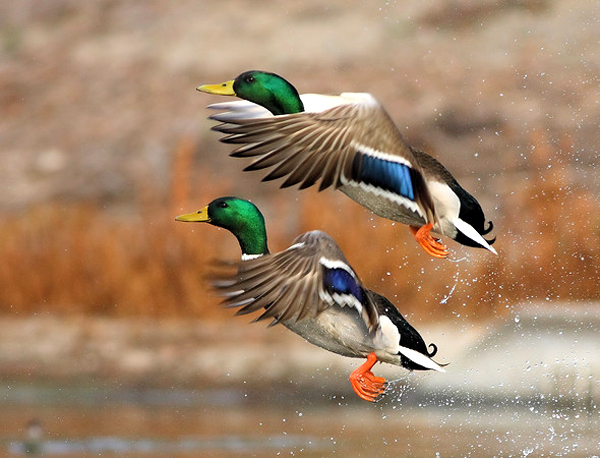 What's your favorite color combinations in nature? consider using one for the walls and the other for the ceiling or back of bookcases. color palettes in a new and different way? Let's keep the conversation going! I'm spending the next couple of months at the beach house. Changing locations really does clear the mind. I love the ocean and the salt air. My daughter just graduated from college. We have talked about taking a trip together. Just last night we were discussing places we would to visit. My friend, Elizabeth of Pretty Pink Tulips just posted about her fabulous family trip to London, a place I have ALWAYS wanted to visit. If you didn't read her post make sure to pop over and read it. Today she posted about one of her favorite stops while there, Blenheim. Her pictures are beyond fabulous. This morning Holly from Things That Inspire posted about her trip to London and Paris and it was equally as interesting. I love all the planter boxes Holly took pictures of on her walks around London. 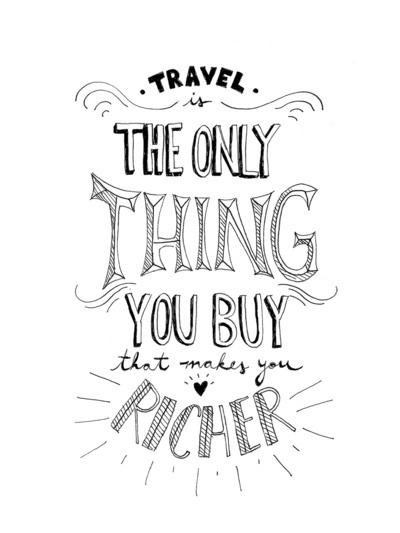 All this chatter about travel has gotten me excited to plan a trip! 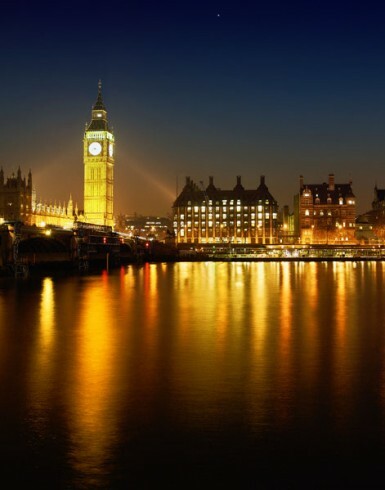 Where would you go if you can travel anywhere? 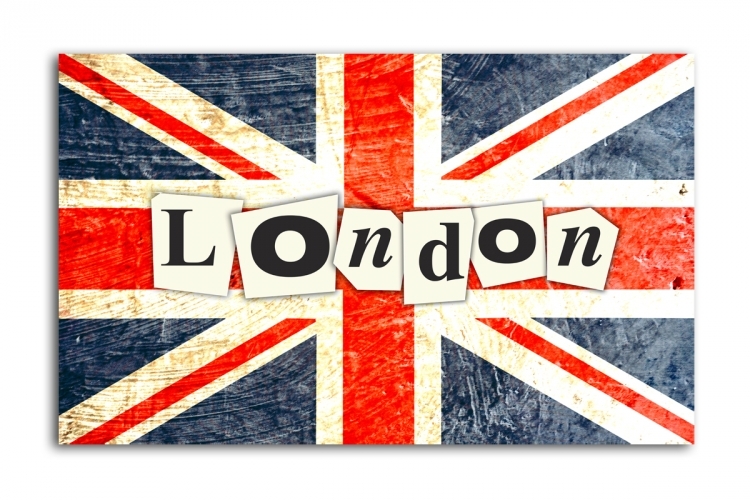 If you have been to London please suggest your favorite things to do while there? To The Men In My Life! Current Obsession ~ No Wonder....It's C. Wonder! Jim Howard & Redesigning a Stair Rail.